One of the things I love about Chinese knotting is that it is so portable. Given some string and the skill of your hands you can make so many things. And so it is that I am most often tying knots while out and about (waiting for kids!) and not at home where my supplies, tools, and scanner are. This blog in particular is an experiment to see how well I can document what I've done with just the recording equipment I've usually got (phone camera). 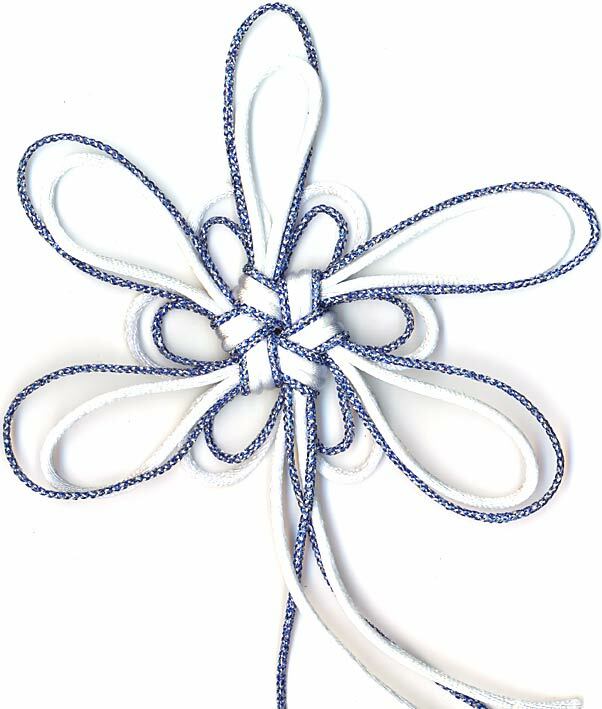 This project uses 2mm white nylon satin cord with 1mm braided blue and silver craft cord. You can get as fancy as you like with tools, but most often when a template is needed, I make one out of paper. Scrap paper usually. Some todo list, shopping list, pamphlet or even a receipt. Since process photos are much easier for other people to understand when it doesn't have my writing all over it, I'll use one of my favourite scrap paper sources: a daily calendar page. First fold the page in half, then at the midpoint of the page (accuracy not that important) make a cone of the paper, then align the edges so that when pressed down the page will be evenly be divided into three. Fold your pie shaped wedge in half again and then cut a hole through all thicknesses of paper. The hole should be close to the point and sized to hold cord loosely. Unfold the paper and pull loops of your cord through the holes. One of the most time consuming and annoying features of tying knots with 2 parallel cords is keeping them parallel. Considering what I had available, I went with the small bulldog paper clips applied to the end of the loops. The back of the template should look more or less like the leftmost picture (note the consistency to the ordering of the string colours). Tie the knot. Remove the paper template and clips. Even up the ears. Make sure the 2 cords stay parallel, and you're done. The camera built into my phone doesn't like to take pictures closer than at least a foot from camera to subject. The pictures in general were pretty blurry, but when the pictures were resized down, and then fiddled with some more, they make decent postage stamp sized pictures.